The new Aurora glass (Phantom Blue) reflects vivid colors from every direction. Stay secure thanks to the Honor 10 Sim Free's Ultrasonic Under-glass Fingerprint Sensor. This innovative ultrasonic fingerprint sensor is situated under the glass enables fast phone unlock, even with wet hands. Further security is gained thanks to the Ultra-fast Face Unlock feature. Dual Sim capabilities allow you to run two sim cards from one handset. Capture the moment with the 24 megapixel and 16 megapixel AI Camera (F1.8 wide Aperture) and take your photos from an Amateur to Professional level. The Honor 10’s AI Camera recognizes multiple subjects and applies localized optimization in One image. Shoot your selfie with the 24 megapixel Front AI Camera for the Perfect Selfie with upgraded face recognition and facial modeling. The Honor 10 Sim Free houses a powerful 3,400mAh large battery with Honor SuperCharge. Super Charge offers Lightning Speed, Safety Guaranteed charging to 50% in 25 minutes*. 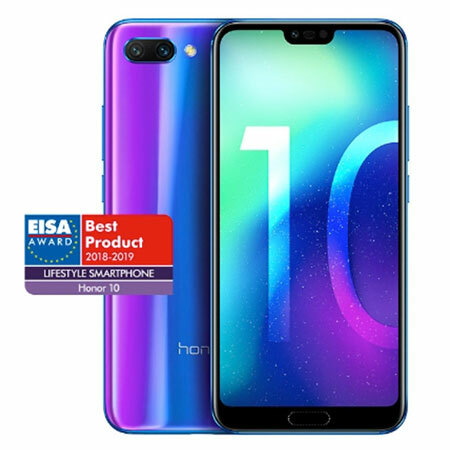 The new Honor 10 runs on the same incredible AI processor first seen in their View10 model which takes performance to new levels. Powered by a 2.4 GHz octa-core Kirin 970 chipset with its own embedded NPU (neural-network processing unit), the Honor 10 is one of the fastest and most capable mobile platforms on the market. Access all of Google's services and Huawei personal themes thanks to Android 8.1 (Oreo) with Huawei EMUI 8.1.